I make it quick and easy. Get in touch and I'll give you a quote over the phone/email. Then I make an appointment to come and buy your vinyl record & CD collection from you. I'm friendly, fair, knowledgeable and professional. I make it simple to sell your records. I buy vinyl record collections and CDs nationwide, pay cash and can take the lot. Distance is no problem. I want your records. Deal with an expert record buyer. "Right from the start, I was impressed with your friendly and professional approach. It was easy to sort out a date for your visit and the actual buying process was smooth. I really do believe that you gave me a good price for the collection and I'm really chuffed that you took away the 'duds' as well. If more people did business like you do then the world would be a better place." We try to buy everything you’ve got, large record collections preferred. We negotiate to buy rare records individually and fairly. SELL your records to me, not to my evil twin! Do you want to sell your record collection? I will buy your records and get them to people who will love to play them. Read what our previous customers say. I found the service from Tom really great. I had cash in my hand within two days and he did everything he said he was going to do when he said he said he would do it. All very professional in sharp contrast to the other chancers who I tried before Tom. skimming rarities! Honest appraisal of what a collection is worth. Prompt return of emails/ phone calls. service. Tom a pleasure to deal with. Tom and I exchanged emails when my uncles record collection became available following his death. I shared a long list of the records for sale and Tom answered promptly, indicating which ones he was interested in and an estimate of their value. Because of the reason for the sale, he was understanding and didn't rush us to make a decision. When he arranged with my mum to visit and collect the records, he was on time and very polite. Mum said he was very nice to chat to. We are both very happy with everything Tom did for us. A real pleasure dealing with Rat Records. I wasn't expecting a reply from Tom so soon as it was a tentative enquiry, but he came back in a couple of days with a price for my beloved vinyl collection that I was very happy with. And he came out to pick them up personally! I was expecting to have to lug them there. Fantastic customer service. Delighted to know that new listeners will be enjoying my 1960s LPs! Thanks for your email, and for purchasing the vinyl. You were a pleasure to do business with. Hi Tom. I think you were friendly, knowledgeble and completely transparent and fair in your approach to valuing the collection. You made the whole thing really easy and it was overall a very positive experience. I'd certainly recommend Rat Records to anyone I know looking to make a sale. You can certainly quote me on that if you wish! It was really hard parting with ***'s records, music was a massive part of his life. But it was part of the process of letting him go and moving on. The flat has to be cleared soon, it's been 10 months, and we couldn't risk the records being there during the clearance. You were great to deal with from start to finish and others will get enjoyment from ***'s records now. I would be glad to provide some feedback.. I work in sales myself, and so hope I can recognise good practice. .
From the initial quick response to initial queries and open and honest discussions on price I felt fairly treated throughout the whole process. You made no secret of the fact that you need to make a profit out of the transaction and that's expected. I had a reasonable idea of what my collection might be worth and felt you offered a fair price. Your parting words that hopefully someone will buy the records and feel like they have something special meant a lot. That's exactly how I felt when I first purchased a lot of them. Rat Records offered me the best deal for my whole collection of vinyl knowing that only a small percentage would be in demand. It was nice to have a nostalgic chat with Tom, and return my vinyl so near to its birthplace ! ( A1 stores -Walworth ) and my home where it kept my mates and girls entertained! Hi Tom first you where good as your word, punctual considering the Dartford bridge had closed you still came. You have an easy manner and where good to deal with efficient honest and as good as your word. I highly recommend you. It was good to meet you last night and a pleasure to sell my record collection to you. I thought you were extremely fair and your offer generous, I can not think why I never sold them before. If I meet anyone else on my travels with a record collection to sell, I will wholeheartedly recommend you and Rat Records. Thanks again. Tom offers a fast, friendly and fuss-free service from offer through to pick up. I can recommend Rat Records to anyone thinking about off-loading their record collection; it's a great way to clear some space and getting instant cash-in-hand is very nice too. Hi Tom, thanks again for coming to buy the records. I thought you were quick in responding to my email, punctual and professional. And of course you gave me more than I expected for my records. Great communication, very responsive, a rapid transaction as well as a fair price. This is a good place to do business with. Thoroughly recommended! Hi Tom,Thank you as well. It was a painless and (to me) interesting process to have someone else going through my records and offering a reasonable deal at the end of it all. I'm very happy with the outcome, as is Mrs Hugh who now has 3 extra shelves on which to stash maths teaching materials! I hope you manage to get shot of the records yourself. In summary, painless and strangely enjoyable process, watching 50-odd years of accumulated cultural history being dismantled, and getting a useful (and I think, fair) sum of money as a result. I was really happy with the record buying service from Rat Records. Tom was really friendly, helpful and most importantly fair in his appraisal of the collection. I'll definitely be contacting them again in the future if I need to sell anything. An honest and open appraisal of my collection from the start with no tactics or hidden agenda. Tom clearly has solid knowledge of the vinyl market and his customer base. Good communication through out the process and an approachable manner made the whole experience straight forward and on the day of collection (thanks to all of the above) we reached a deal which was mutually agreeable. I was very happy with the whole process. It was a very enjoyable experience dealing with Tom in the selling of my record collection. Living out in Surrey and being somewhat frustrated by the lack of responses from local dealer I contacted Tom via his website link. We fixed a time to review the collection. He arrived on time, worked quickly and efficiently and gave me what I felt was an honest and fair price for my collection. I would highly recommend Tom if your thinking of selling part or all your collection. The fact that you know your records will be played and enjoyed again should also credited to Tom. I'm glad that the records will go to good homes. Dealing with you was a pleasure. You were reliable, honest and above all very fair. I needed to sell my late father's Jazz collection which consisted of a large number of CDs and Vinyl. I spoke to Tom and he was very helpful giving a price which I was happy with. The whole process was dealt with very quickly. I would definitely recommend Rat Records if you have a large collection to sell. It was a pleasure meeting you as was the whole transaction. Your initial response was not only quick but also well expressed, reasoned and almost apologetic. Even having trekked a long way you were very sympathetic in giving me a chance to change my mind at the last minute and hang on to my cd collection. The fact that you came such a long way to pick them up was also a real benefit. You obviously are really knowledgeable about music as well as your own business and clearly a genuine and enthusiastic music lover. I would have no qualms whatever in recommending your friendly and hassle free service. We were impressed by the prompt and efficient way you dealt with buying our son's rather esoteric CD collection, from making an initial, and very fair, offer to arranging collection. We appreciated your honest, upfront approach. Everything was very straightforward and we'd certainly recommend you to anyone looking to sell any kind of music. I'm a technical person by both nature and profession, so logistics and problem solving are second nature to me, so to answer your request for feedback, I am asking myself how would I do it and what could be better, but to be honest there's little I can think of, other than maybe acquiring some of those collapsible plastic storage boxes (and a calculator!). Fair point, I'd run out of boxes that day! - T.
It's been a pleasure to deal with Rat Records, and your expert knowledge and integrity were evident from the first contact. Your assessment of the collection was thorough and efficient, and the valuation was conducted fairly and professionally. I would not hesitate to recommend your services to anybody wishing to dispose of a record/CD collection seeking a fair and realistic price. Rat Records have a strong enthusiasm for what they do which came across clearly on the web site. I spoke to four people about buying my records. One was an individual who just wanted to cherry pick his way through my albums; another was more interested in a different genre of records. The third didn't really exude any great enthusiasm for the sample records that I listed for him. All of these were close to where I live. But Tom was willing to travel to assess my collection. He had already given me some indicative prices and explained how he graded the records. He was knowledgeable and it was nice to hear from someone who remembered some of the bands that I thought were great at the time and should have had greater success. It was good to spend an hour and a half gently reminiscing, without getting too sentimental, about a time in my life that was formative for me. We agreed what seemed a pretty fair price to me (and to my wife, who is the haggler in our household). I helped Tom load up his van and he left for the M1 with me feeling no regrets. The records had after all sat in the loft unplayed for nine years. I didn't need the money, but it was good to get what feels like a fair price. And it was better still to have felt like your 30 year old record buying decisions had been (broadly) good ones. Hi TomI felt it was fair the way that you worked out a cost; I was concerned I'd have a 'wheeler dealer' in my house and it wasn't like that at all! 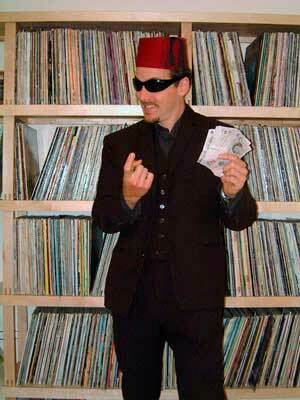 Tom Fisher from Rat Records made the sale of my records a very easy and rewarding experience. Easy, because he agreed to take the entire collection away and paid more than I expected---and rewarding, because I know that someone else will continue to get pleasure out of those records. I'm emailing you to say how brilliant I thought you were! It was a pleasure and I hope you can make a nice profit on them, its good they have gone to a nice home. Like many people I had quite a large collection of Vinyl LPs sitting doing nothing in my loft for many years gathering dust. I did spend quite a large amount of time putting some of them on eBay but found that it was extremely time consuming and often I didn't get as much for the record as I had hoped. I then had the good fortune of coming across the Rat Records website. I contacted Tom and sent a random list of some of the titles I had. He replied almost immediately and came out to view them the next day. He then offered me what I considered a very good price and took them away. I can only thank Tom for the extremely quick and professional way he dealt with me and would definitely recommend him to anyone looking to dispose of their record collection. Having narrowed down my options , I approached three different buyers to sell my 700 CDs and 70 remaining vinyl records. I chose Rat Records and I�m glad that I did . Whilst there was not a huge disparity in the initial pricing indications, from the speed and clarity of the first response through to the organisation of the pick up, Tom Fisher was head and shoulders above his competition. As I have said, it was a pleasure doing business with you. You were courteous and business-like (a difficult combination to get right, which you do, so top marks there). You made the process simple, explaining what you were looking for as you went. I felt that you were giving me a good price for the records that you bought. Thanks Tom,It was a pleasure to deal with you. I was more of a "glad to" than a "can't bear to part with" seller of my son's Dance, Funk, House, Jazz, Soul, Techno Vinyl Collection. That said, I enjoyed dealing with Rat Records and with you personally as the face of the business. I confidently and happily recommend Rat Records to others based on the fairness I experienced as a seller. I had a couple of hundred records to sell and I was swayed to go with Tom of Rat Records because of his very professional and honest approach. May they go on to a better home! Here are some words for use as, in the quaint words of the adverts you used to find on the inside pages of the News of the World would put it, an 'unsolicited testimonial'. In a fit of downsizing and after much soul-searching I decided to finally do something with my records. I wanted them to go to loving homes, and after a good deal of internet research contacted Rat Records. To say the least I was happily surprised. Not only was there a real response from a real person, but that person (Tom) came and looked at the records and took them away to be passed on to others - and he even paid me a more-than-reasonable price for them. I would recommend Rat Records to anyone. Dear Tom, It was an educational experience having you check through and choose some of my LPs to buy. I thought you were professional, efficient, informative, speedy, and of course it was very convenient that you could do a home visit to value and take away. Hello Tom. Apologies to your wife for tearing you away from your holiday and appreciate your coming out of your way. You beat me to it as I was intending to write to say thank you. It was a strangely pleasurable evening - sad to see decades of memories going but glad I chose you to sell to. You know your business well and gave me a very fair price. It is good to know that valued records will be passed on to people who will appreciate them.You may quote me and I have no hesitation in recommending you to others. Tom certainly knows his stuff. He made the emotional wrench of losing 40 years worth of collecting much easier to bear. A week later I am completely over it and looking forward to the next chapter. I thought the whole process off selling my collection was very stress free and i appreciated the time you took to explain the buying process and why the values of each lp and single was what they were. I thought the price you offered was very fair and appreciated that you took an interest in the whole collection and not just parts of it.Thank you again for coming to check out the collection. Following the death of my father and my mother subsequently moving home, I unexpectedly found myself in possession of my father's extensive record collection. After a lengthy process of compiling a list, categorising and storing the records it was clear that I had neither the time nor the space to honour my father's collection going forward. I sent the complete list off to 6 record buyers that I found on the internet and Tom at Rat Records was the first to reply. After a brief correspondence requesting further details on the condition of the records Tom returned my list with his estimated prices and an in depth explanation around record buying in general and the justification around his estimates. This information was both enlightening and informative. I agreed to sell the collection to Tom and arranged a date and time for him to come round. When he arrived I left him to have a good rummage through the records and when finished we agreed a price that was at the top end of the range he had originally estimated. He also took away the records that he did not think would be big sellers (which didn't come as any surprise) and saved me a trip to the tip. Tom was great to deal with and made what I thought was going to be a bit of a headache, into a quick and easy operation. Dear Tom, it was a pleasure to meet you and a pleasure to do business with you. I am glad that your customers are happy! I thoroughly enjoyed the process of selling my new wave and alternative record collection to you and felt that you were very honest and honourable, as well as knowledgeable and charming. Thank you for helping me to make some difficult decisions - and for helping me let go of the past and move into the future. Of all the record dealers I contacted, I felt you were the most fair and honest. Hi Tom. Great stuff! I'm really pleased your happy with the records. I started collecting reggae records 19 years ago and thought I'd never sell them, but things change! I'm glad others will enjoy them though! Likewise been great doing business with yourself never thought I'd sell my records that quickly, thanks again. I will not hesitate to recommend you to others to buy records. Hi Tom. Just to say thank you for coming over, viewing my vintage vinyl records and purchasing a substantial portion. As you say in your website, the whole exercise was painless. It was also exceedingly professional and I am very happy at the prices you offered. It was very interesting to see the differential rates for buying blues and jazz records based on your assessment of their popularity. It is a very fair method for pricing an old record collection. It was a pleasure dealing with you and all the very best to you and your company. I'd definitely recommend selling to Tom at Rat Records. We got a prompt response to our initial enquiry, and Tom took the time to explain his pricing system and the bigger context for selling second hand vinyl records. He was fair and professional when he came to buy our record and cd collections; we were very happy with the price offered and also glad that he was able to take non-resale items off our hands. All in all, a very good experience. Tom. Just a quick note to say that I never expected to enjoy selling my record collection, but you made the process a remarkably upbeat one. It was a pleasure to meet you, and I feel that the punk and indie records couldn't have gone to a better place. Many thanks for a very interesting afternoon, and for a fair price for buying my record collection. Doubtless I'll be in the shop in a few weeks trying to buy some of it back. I personally found you very experienced, knowledgeable, and helpful. I had tried to sell my second hand soul record collection on many occasions and I found yourself the most honest record dealer. I would definitely trade with yourself again and would highly recommend Rat Records. Nice guy to do business with. He'll give you a very honest valuation of your second hand CD collection, then come round and collect waving a fistful of cash. Struck me as a very genuine person, to the point where I have passed his details onto others. Contacted Rat Records via the Internet to gauge if there was any interest in them purchasing my vinyl record collection. Tom contacted me and gave me some very helpful information regarding the value of second hand records that I was trying to sell and also as to the various ways that I could go about selling my classic rock record collection. In the end we arranged a meeting which resulted in me selling around half of my LP collection to Rat Records for a fair and reasonable price. Throughout the process Tom proved himself to be both knowledgeable and fair in his dealings. Thank you for coming all the way down here, it really made things so much easier for me! Hmm..comments..:I chose Rat Records as after the first communication I had with you I felt informed and confident that you knew what you were talking about and would offer me a fair price. It helped to have the process explained to me, knowing nothing about classic rock records at all, and the fact that you could come to me really helped us. I was pleased with the price I received for the record collection and generally felt very comfortable and confident in the sale. I would recommend Rat Records to anyone that has some unwanted vinyl, or even looking for somewhere to purchase them, as the service was excellent. Hope you managed to sell some of the records on Saturday - and that they went to a good home! It was very nice to meet you and I found the whole process very easy and stress free. It was great to be able to send you a list of the Indie records and to quickly get back individual prices for each record you wanted to buy . It was also a big bonus to have the records collected - including those you didn't want! If I hear of anyone wanting to sell their collection I shall definitely pass on your details. Nice to put something back into the Rat! Having been a customer there for quite some years while in London, I was pleased to receive the same quality of service, knowledge and understanding from a record collection selling perspective. The chap picking up the records was superb - even my mum said he was a nice man. The whole exercise was painless. It was also exceedingly professional and I am very happy at the prices you offered. It was very interesting to see the differential rates for the records based on your assessment of their popularity. It is a very fair method for pricing an old record collection.I was sorry to see the Rock albums go but they have not had much usage in recent years. So I am happy for you to sell them to others who, I hope, will get as much pleasure from these great artists as I have had in the past.It was a pleasure dealing with you. Thanks very much for buying my collection. You are a very sociable friendly chap who's enthusiasm rubs off. It was very nice talking to you about Dead Can Dance and Kraut rock (not many fans in my neck of the burbs). You gave me a very fair - and honest - offer which I was more than happy to accept and I am sure that whoever buys them will have as much fun listening to them as I have had. I would certainly recommend any of my friends to get in touch if they are thinking of selling their own collections. Thanks once again. I was certainly pleased with our connection and dealings. Your emails were informative, non-patronising and down to earth. Your own enthusiasm for albums of the 60s and 70s came through very clearly. I hope to delight your shoppers with the last dozen or so albums after I have converted them to the dreaded MP3 format. Most of all, I think, the thought that the Jazz albums would go to people who would appreciate them made a huge impact on my decision as to selling on. I wish you all good luck and longevity. Made a potentially painful process an actual pleasure. Thoroughly recommended. It was great to meet you last week. I'm glad you had some happy customers afterwards. It's nice to know some old vinyl friends are going to good homes.I was most impressed with your professional approach, which was both methodical and unobtrusive, and with your depth of knowledge and interest in a wide range of musical tastes. What kind of vinyl you were looking for and what you were prepared to pay for it was set out very clearly from the outset and your personal visit was not only well-organized and friendly but a most enjoyable and relaxed experience too. I am glad so many of my 'old friends' have gone to good homes and wish you and your business well in the future. I'm very pleased to have sold some of the records to you and happy in the knowledge that they will get played.I was very impressed with your buying skills. You were extremely professional and courteous and gave me exactly the right information on pricing that I needed in order to decide whether to go ahead with the sale. I would highly recommend you to anyone wanting to sell a record collection. Good to see my Punk and New Wave records going to a good home. From a personal perspective, I was extremely impressed with your professionalism, honesty and knowledge and was more than pleased that we agreed on a fair price with the minimum of hassle. The fact that you were prepared to visit me at home and collect from there was a big plus for me. My dealings with Rat Records was a pleasure. All the best and I can wholeheartedly recommend your services to anyone and will do so at every opportunity. I got a very speedy response from Tom post my initial enquiry and from start to finish the whole process was conducted in a highly professional manner. He was very straight as far as prices were concerned and took considerable trouble to explain the vinyl marketplace and put it all into context. I was happy with his valuation and feel my Hip Hop collection departed in safe and knowledgeable hands. All in all a very nice guy and would recommend you contact if you ever consider parting with your vinyl. Just to say that I will not hesitate to recommend Rat Records to any of my friends who may wish to part with some or all of their record collections.Thank you for being so straight forward and pleasant in the way in which you went about the business of valuing my stock of Soul and Funk LPs.Best wishes for your business - long may you prosper. My beloved collection of early 80s Soul and Dance music had been sitting around unplayed for years. I was in I dilemma - I couldn't bring myself to part with them, but on the other hand - think of the pleasure they could bring to others if I sold them. After much soul-searching, I spoke to Tom at Rat Records. Here was somebody that knew his music and I knew would find my records another loving home. It was still a sad sight to see them disappearing up the road in his car, but I know somewhere in South London, someone is enjoying my records just as much as I did. Tom bought all of my vinyl and pretty much all of my CD collection. I initially contacted him via email and he was fast and thorough in his response, outlining the pitfalls and conditions of his business succinctly.When he came to view my collection he was again thorough and also sincere. I had done a little research about the Psych and Progressive titles before he visited and armed with this information I felt that the prices he offered me were perfectly reasonable. He made what was essentially a painful process as easy as it could be in the circumstances. I have no hesitation in recommending him as an honest businessman and believe him to be a genuine music lover. My thanks to Tom who made the painful process of selling my entire vinyl collection a lot more manageable. I also knew the Funk and Disco vinyl would be going to not only a great record shop but eventually to a good home. Tom was also very accommodating, driving down to Canterbury on a Sunday and picking up my record collection and giving me a fair price. It was also nice to speak to someone who knew their records and was genuine with it. I would recommend Tom to anyone else who wishes to sell their vinyl. Tom and his team were helpful from the first email. I had checked out a few other shops and websites, but the hassle factor seemed significant. Tom made it easy, and the price was fair and we agreed a deal without lots of needless haggling or any feeling of being ripped off. Thanks for making the process of letting go of my vinyl records a pain free experience. In fact, it was quite good fun! It had taken me a long time to decide that my vinyl and me needed to part ways. Right from the start, I was impressed with your friendly and professional approach. It was easy to sort out a date for your visit and the actual buying process was smooth. I really do believe that you gave me a good price for the collection and I'm really chuffed that you took away the "duds" as well.If more people did business like you do then the world would be a better place.Thanks once again. It was a surprisingly pleasant experience to sell my collection to Tom at Rat Records. He responded promptly and fairly to my initial enquiry and made life easy for me with his knowledgeable advice and a willingness to take my whole Reggae collection, including non resale items. The icing on the cake came with an unprompted increase in his offer after inspecting my collection - ten out of ten for integrity! Tom makes the process of selling a record collection very painless!!! He very fairly explains the process of the pricing into their different bands and then systematically goes through the whole process until the front room is covered in piles of records. My collection numbered about 1000 so there were quite a few piles!!! He then boxes them up, hands over money for them, loads them, somehow, in his car and drives them off to Rat Records in the sunny South of England!!! This was my second dealing with Tom and both were very fair transactions. We had records sitting in a cupboard for over 10 years but moving house forced us to do something with them. After several negative responses from buyers, whose headlines were that they needed the records we owned, we discovered Rat Records. From my initial contact with Tom it was such an easy and stress free transaction. He was helpful by responding to my emails quickly, giving me prices up front and being honest about the record market. I probably could have got more cash by spending weeks using eBay, going to car boot sales and still having loads left over but that was not an option for me. Having been given a price for the 2 collections we visited the store one Saturday. Unfortunately Tom was not there, however his partner, Philippe, knew we were visiting and was up to speed on the transaction. With a quick check on condition we received our cash and left with an empty trolley! Brilliant! We hope the buyers enjoy the records as much as we did in the past. The store is also worth a visit if you are buying, it is a very calm environment where you are welcome to spend time browsing.Thank you Tom and Philippe, we wish you every success with your store. It was an absolute pleasure doing business with you, a very positive experience with fantastic customer care. I had a large Jazz collection, which had become surplus to requirements. I had several offers from other dealers, which were not a patch on what Tom offered. It was a quick and easy transaction. I would not hesitate to deal with Tom again, in future. I was very pleased with your services overall, you gave me a good, detailed quote which put everything in perspective from both our points of view and I was pleased with the amount of money I received for the Indie records too. I appreciate the difficulty of selling on all these items you're accumulating so I'm thankful for the time you took travelling here and I will definitely take some records off your hands when I'm next in the area! Hi Tom,Sorry for the delay in responding- the aforementioned baby that prompted my vinyl pruning arrived last week, since then everything has been a blur! You record buying and selling skills are exemplary, especially given the marketplace you are in! To put it in perspective: days after you had already quoted, collected and probably started selling my vinyl, another shop got in touch to tell me they could not quote me without seeing the records but would be interested in more than half, and invited me to bring them in. A week later another place contacted me with the same message. Of course I understand the challenges of dealing in secondhand vinyl but I think this puts you head and shoulders above the competition in terms of buying a couple of crates of wax! As far as selling goes- my days of milling around Camberwell are sadly passed since I stopped studying at the art school, but I always loved checking in at Rat Records for the reasons you have given yourself: your stock is priced to sell rather than to hang around for someone who is willing to fork out for the top price. Also you have a great selection! I picked up some really nice 80s boogie records, a D'Angelo 12", probably some nice Hip Hop I was already too old to play in public and a lovely Bruce Springsteen single with a ticket stub in the sleeve! A bit of everything but with a sense that people are putting thought into what goes on the shelf. Definitely worth a trip south of the river! Thanks again for picking up the records- I hope they sell for you. I found selling my vinyl collection to Rat Records both easy and painless. I found Tom (my buyer) totally efficient and reliable. He kept me well informed at all the various transaction stages with an informative assessment of the value of my Jazz and Classic Rock collection and kept his promises with respect to visit appointments. A pleasure to do business with. Hi Tom,It was a pleasure to meet and deal with you. Everything was very simple and easy. I'm glad that the vinyl "memories of my youth" have gone into safe temporary custody until they move onto their new homes.I will, of course, pass on your details to anyone that I know who is seeking to sell their record collection.